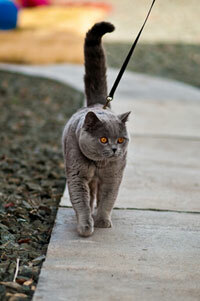 Today's British shorthair is a large, compact, powerful cat with a broad, strong chest and short, strong legs. The massive head is round and set on a short, sturdy neck. The face has round underlying bone structure, and the muzzle and chin are well-developed. Medium-sized ears are set well apart, fitting into the contour of the head. The eyes are large, and the broad nose has a gentle dip in profile. Full cheeks and large, well-rounded whisker pads give the cat a perpetual smile. As you might guess, the overall impression of the cat is one of roundness. Brits mature very slowly, reaching their physical peak at about five years. The Brit's coat is as plush as a deep pile carpet; the thick undercoat makes the fur stand away from the body. The fur feels like firm, warm velvet to the touch, prompting fanciers to dub Brits the teddy bears of the cat kingdom. The coat density changes with the seasons with the greatest density occurring in the winter months. Brits enjoy following their chosen humans from room to room to keep an eye on all activities. They also enjoy interactive games with their human friends, but they relish their quiet time, too. Unlike some breeds that crave constant attention, Brits enjoy being by themselves on occasion. This makes them good choices for folks who must spend part of the day away from home. One thing Brits are not, however, is lap cats, or cats that enjoy being picked up. They'd much rather sit beside you, or curl up at your feet, than cuddle on your lap. When picked up they stiffen like fur-covered boards, legs stretched stiffly out and heads turned resolutely away until you give in and put them down. Grooming a British shorthair is easy. Because of the Brit's dense undercoat, a good once a week combing for five to ten minutes with a good quality steel comb is recommended. However, breeders recommend daily grooming during the spring and fall shedding seasons to keep your Brit looking beautiful and avoid a blanket of hair on everything you own. Bathing your Brit is not needed unless you plan to show. 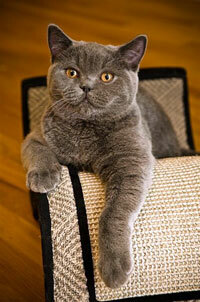 Pricing on British Shorthairs usually depends in each individual kitten's bloodlines, type and markings. Usually kittens available between twelve and sixteen weeks of age. After twelve weeks, kittens have had their basic inoculations and developed the physical and social stability needed for a new environment, showing, or being transported by air. Keeping such a rare treasure indoors, neutering or spaying and providing acceptable surfaces (e.g. scratching posts) for the natural behavior of scratching are essential elements for maintaining a healthy, long and joyful life.